Huawei has launched new large-screened smartphones in the wake of Samsung's Galaxy Note 7 disaster. The Mate 9 handsets are among the first to be powered by Android 7 and come in two designs: a model with a 1080p "full HD" display, and a Porsche-branded edition with nearly twice the resolution. The Chinese company says it has also tackled smartphones' tendency to slow down over time. But one expert said Western consumers were still uncertain about its brand. 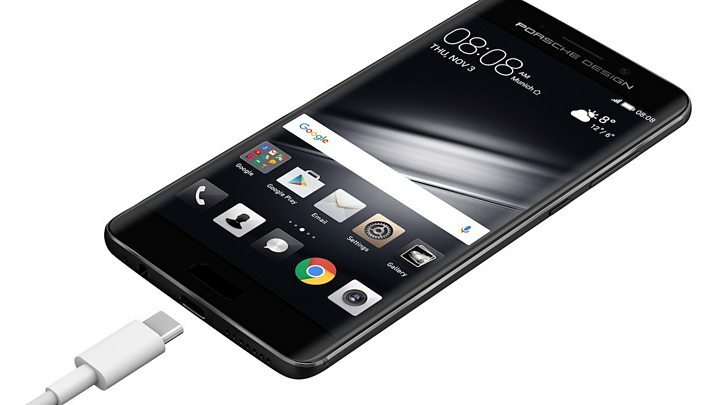 "Huawei has never been a company to miss an opportunity, and it seems as though it has moved mountains to get the Mate 9 to market as quickly as possible," said Ben Wood, from the CCS Insight consultancy. "But the phone is not a like-for-like comparison with the Note 7 - for one, it doesn't have a stylus. "Huawei's brand also doesn't have the status of Samsung as yet. "That's why it seems to be blending its brand with others. "So, for the camera, it has partnered with Leica, and for the limited edition model, it has worked with Porsche. "But Blackberry also partnered with Porsche in the past, and although that generated interest and created a halo-effect for other products, they didn't sell massive volumes." Samsung scrapped its Note 7 phablets last month after dozens of the devices caught fire. The South Korean company initially thought a battery fault was to blame, and switched its own component for a third-party power cell. But the problems continued, and after failing to identify the cause, Samsung halted production and said it was scrapping the 4.3 million handsets it had already manufactured. Like the Note 7, Huawei's new phones also feature a "supercharging" battery technology that promises to deliver a day's worth of power within 30 minutes and a full two-day charge in 90 minutes. The company's senior product manager, Michael Seitz, told the BBC that the system had been through a nine-month development and testing process and had been checked by an independent research lab. "It keeps really cool in your hand even while recharging," he said. Several analysts have suggested Huawei is best placed to benefit from Samsung's setback. Apple underestimated demand for its largest model, the iPhone 7 Plus, leading to a backlog in orders. And Google has acknowledged having a similar problem with its Pixel XL phone. It has also locked itself into exclusive deals with single operators in the US, UK and Australia - struck before the Note 7 fiasco - which will limit sales. Mr Seitz said that Huawei had enough production capabilities to meet high demand for the Mate 9 and intended to be the bestselling brand by 2020. The Mate 9 phones are slightly smaller than last year's models. The standard edition has a 5.9in (15cm) screen and starts at €699 ($774; £622). The Porsche Design has a 2K curved display measuring 5.5in (14.0cm) and costs €1,395 ($1,545; £1,240). They are both powered by a new chip - the Kirin 960, which was designed by Huawei itself. It says it is the fastest smartphone processor to date. Moreover, Huawei says it has developed proprietary technology to address the fact that smartphones tend to run slower once they have been used for several months. "Our phones will on average be 80% faster than another device after one year," a spokesman said. The Mate 9 phones lack an artificial intelligence interface, like the Google Assistant or Apple's Siri. But unlike those handsets, they can be fitted with a microSD card, offering up to two terabytes of extra storage. In addition, they offer an unusual audio facility thanks to four in-built microphones. After a recording has been made, an app allows the user to remove one sound source to better hear another. This can be used to hear what one person was saying at a meeting, for example, if others were talking over them, or to improve recordings from a concert. In addition, the technology provides a noise-cancelling facility during phone calls, making it easier to have a conversation at a busy location. But Mr Wood suggested the most significant change was an overhaul of the phones' software, which is designed to reduce the number of taps needed to reach its features. "Huawei has recognised that its previous Chinese-flavoured user interface design didn't translate well to all markets of the world, and has gone for a softer, cleaner interface this time round," he said. "It strikes me that it has really looked at the competitive landscape, recognised the things that do well on the iPhone and Samsung devices, and evolved its own product in that direction."